This entry was posted in Language Training and tagged April 2019 on March 27, 2019 by Cara Keirstead. For over forty years, the Summer Research Laboratory at the University of Illinois at Urbana-Champaign has provided scholars from around the world with the opportunity to work in our Library’s famous collections in Russian, East European, and Eurasian Studies. This entry was posted in Funding, Professional Development and tagged February 2019 on February 12, 2019 by Cara Keirstead. 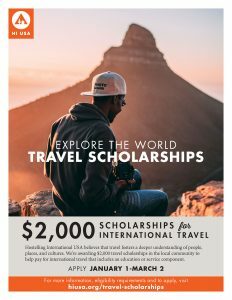 Hostelling International is offering five $2,000 travel scholarship exclusively for Austin area residents! The program is called Explore the World, and it’s administered by the nonprofit organization, Hostelling International USA (HI USA). HI USA is committed to creating a more tolerant world, and these scholarships are for young travelers inspired to make the world a better place, but lack the financial means to go abroad. The scholarship is open to individuals, ages 18-30, who will engage in an educational or service learning component during their trip. Eligible candidates must also meet specific financial need requirements. More information can be found at www.hiusa.org/travel-scholarships. This entry was posted in Funding, Travel/Study Abroad and tagged March 2019 on February 5, 2019 by Cara Keirstead. In 2014, the ASEEES Board of Directors voted to dedicate $10,000 per year from the Association’s endowment dividends for subvention of books by first-time authors who have already secured publishing contracts. Multiple awards of up to $2,500 will be made on a competitive basis each year, with funds paid directly to the press. This entry was posted in Funding and tagged February 2019, September 2019 on January 31, 2019 by Cara Keirstead. This entry was posted in Calls for Papers (CFPs), Conferences/Seminars and tagged February 2019 on January 31, 2019 by Cara Keirstead. Applications are invited for the position of Stuart Ramsay Tompkins Visiting Professor at the University of Alberta, Edmonton, Alberta, Canada. This is a nine-month appointment to be held jointly in the Departments of History and Classics, and Modern Languages and Cultural Studies (MLCS, home department for the appointee). The Visiting Professor will be expected to be in residence from August 26, 2019 to May 29, 2020, and will also be expected to participate in the intellectual life of the sponsoring departments. The successful candidate will teach two one-term courses during the year in the area of expertise (available to students in either department), and give a minimum of two public lectures throughout the year. It is anticipated that the appointee will hold regular consultations with graduate students in related fields throughout the stay and serve as an ambassador for the program upon returning home. This entry was posted in Academic Jobs, Job Postings and tagged February 2019 on January 28, 2019 by Cara Keirstead. American Councils for International Education is now accepting applications for its summer 2019 regional studies program in Russia! We look forward to sending students of all academic backgrounds and language levels abroad this summer. No foreign language experience is required for this program. Eligibility: Open to students 18 and older. No Russian language experience is required. Minimum 2.7 GPA. This entry was posted in Travel/Study Abroad and tagged February 2019 on January 28, 2019 by Cara Keirstead.